Robert Andrew, Detail, “Touching Pindan,” ochres, bluestone, assorted rocks and aluminium, 2016. Ground to Another: By Jenna Green. In a white room a machine labours beneath me. I am drawn to its movement, a slow drag of one stubborn material across another. I watch as two rocks held by restrictive cables are pulled and pushed over bluestone. 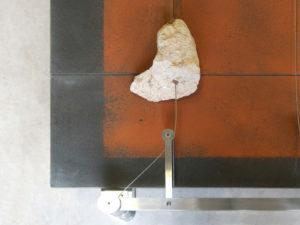 Nudging and knocking a rock between them, they disturb a thin veil of ochre atop the tiled surface, making marks as they shift. I contemplate the slow burn of the unanswerable questions in front of me. Like many Australians, Robert Andrew has an eclectic heritage. With Australian Aboriginal, Anglo European and Filipino roots, Andrew grew up in Perth, heading north to visit family during holidays. A descendant of the Yawuru people of the Broome area, Western Australia, it wasn’t until around aged 13 that he became formally aware of his Indigenous heritage. Originally ambivalent, it was an inability to place his family amongst predominantly negative media representations of Indigenous Australians that drew Andrew to consider his heritage more deeply. Interested in the disjuncture between Anglo European and Australian Aboriginal culture, Andrew’s art practice explores this tenuous space and his place within it. Using technology as a tool with which to speak, Andrew’s work discusses issues of identity, power, and impermanence.